Above pricing includes one colour print. Setup charge included in cost. Pricing is for both kids and adult sizes. Our promotional Printed Wristbands are a great way to brighten up your next event or festival. 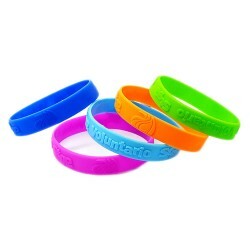 With a range of bright colours and plenty of logo print space, these silicone wristbands will look good and help your brand stand out. Our Printed Wristbands come in a range of colours including purple, white, yellow, red, orange, pink and blue and are available in sizes for both children and adults. The children’s sized wristband comes with a logo print space of 180mm x 10mm while the adult version comes with a print space of 200mm x 10mm, meaning you get to make the maximum promotional opportunities from the one product. The branded Printed Wristbands are a great budget friendly product, and while one colour print is included, we can easily print in additional colours to suit your promotional requirements. Many of our clients use wristbands when it comes to events and festivals where they need to simply identify attendees, or need to separate their attendees by the type of ticket they hold. 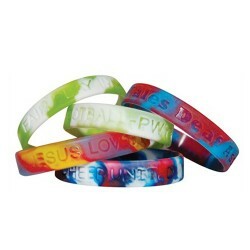 Whatever your need, our promotional Printed Wristbands are a great addition to your promotional products.